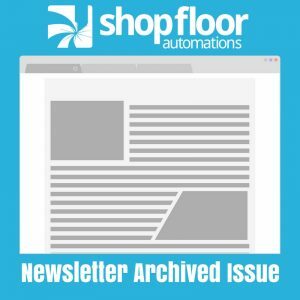 The following is an archive of the Shop Floor Automations Newsletter – July 2011. Your company’s business applications and network are continuously improving, however, the manufacturing network may not have seen a technology update in years. Legacy systems are still in place using switchboxes, RS232 cabling and old Windows operating systems that seem to just hang on. It might be time to consider a few new tools which includes tips and tricks when updating the shop floor. Over the years, RS232 cabling and switchboxes or serial hubs have been the standard to link CNC machines together. With this connection came limited length in cable runs, slow baud rates and power spikes. Embracing the same technology as your office PC’s use, you can now run Ethernet cables to network-based machines. But what about your older serial based machines? Now you can breathe new life into them with our FlexN hardware. Run Ethernet cable from a standard network switch to each machine, across longer distances using TCP/IP error correction protocols. Leverage the fastest baud rate at your CNC and eliminate the bottleneck! There are ways to control, manage and transfer data to your network based machines with confidence and using Predator DNC Software. FTP and TCP/IP protocols are built into the DNC Networking application that currently manages your serial based machine and allows one product to do it all. You can optimize your system by calling your account manager to arrange a system review and make a recommendation to utilize the full features of your investment in Predator Software.